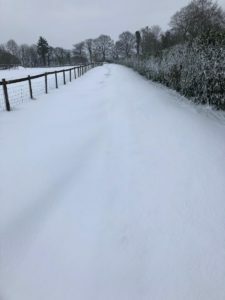 It has been a pretty mild winter up until the recent snowstorms but like most of the West Country, we got a fair helping of snow last night and it required plenty of hard work from our excellent team to get the horses out for some exercise and allow the horsebox to head to Wolverhampton with our four runners this morning. Surprisingly we have been relatively busy this January on the runners’ front, as we have had quite a few backwards types that have needed some time and patience as well as some new arrivals to the yard to join our hurdler CHAMPAGNE CHAMP (pictured) in the winter string. The hard work to get the runners to Wolverhampton nearly paid off with a winner this afternoon as GREYZEE just got run out of victory in the final 20 yards in the finale. A son of Zebedee that is out of a half-sister to MASTER CARPENTER, he has strengthened up during his six months off the track and clearly showed that he can win a race off the back of his two handicap starts this year. Meanwhile a messy race meant things didn’t pan out for ARDIMENTO, Sir Roderic’s full brother, in the Novice race but he showed he has plenty of ability finishing fourth and he is an exciting horse for the future. While we got the bonus of an extra meeting at Wolverhampton today, it was frustrating to miss out on running CHAMPAGNE CHAMP back over hurdles yesterday as frost claimed Wincanton. He has had a wind operation over the summer and we are hoping it should help him finish his races off a bit better as he can carry his head high and wander in the closing stages. Unfortunately the vet found that he had an irregular heartbeat when never travelling in his prep race on the flat so we had to back off him for a few weeks. 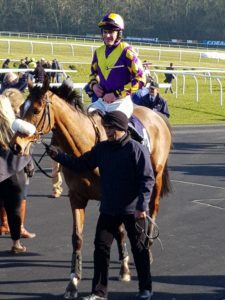 To ensure he had fully recovered, we ran him back on the flat again five weeks later and he showed he was back to normal with a solid third, the steadily run race not suiting him at all. It’s a slight question as to where he runs next due to the weather but we look forward to seeing him in some decent handicap hurdles. Another one that has not had much luck in some messy AW handicaps is SINGING THE BLUES who did not get the clearest of runs when finishing third at Kempton before getting messed around in front when sixth there a week later. We are back to Kempton tomorrow evening as PLUM DUFF makes her racecourse debut in the 7f Novice at 5:15. A daughter of Showcasing, she is the first foal of a three-time winner and while like all of ours she will improve plenty for the experience, it will be good to get her to the track.